Despite the growing hegemony of screen culture, paper still reigns supreme. In this exhibition of its many forms and ends, Erin Cramer’s open containers of its variable ingredients—kozo, abaca, flax, wheat straw, cotton—makes for the most memorable display. Cramer models the material into the shapes of familiar animals, and the results are as cute as teddy bears and no more profound. Just as playful, though more adult, are the figurative drawings and cardboard constructions by Joe Fournier, an editorial cartoonist for the Chicago Tribune. He draws voluptuous female figures with dynamic linearity, but they mostly appear like facile parodies of Picasso of the fifties and sixties. Many pieces in this material-focused show seem to emphasize the artist’s facility with media: Phil Ponce’s ability to cut a decorative screen out of Tyvek; Monika Wulfers’ ability to fold a manga book into a cone; Andrea Peterson’s ability to incorporate natural materials into the paper that also depicts them. The overabundance of printed paper can be repurposed for quick sketching by professional as well as outsider artists. Kevin Fair is a waiter at Miller’s Pub who has been marking up receipts with his fantasies for more than a decade. Rebecca Wolfram is a narrative painter who sketches daily from newspaper photographs. Stretching across walls and even the floor, their hundreds of drawings introduce us to two vibrant, creative people, though I doubt that many viewers will pause to study each and every page—the visual quality just isn’t there. 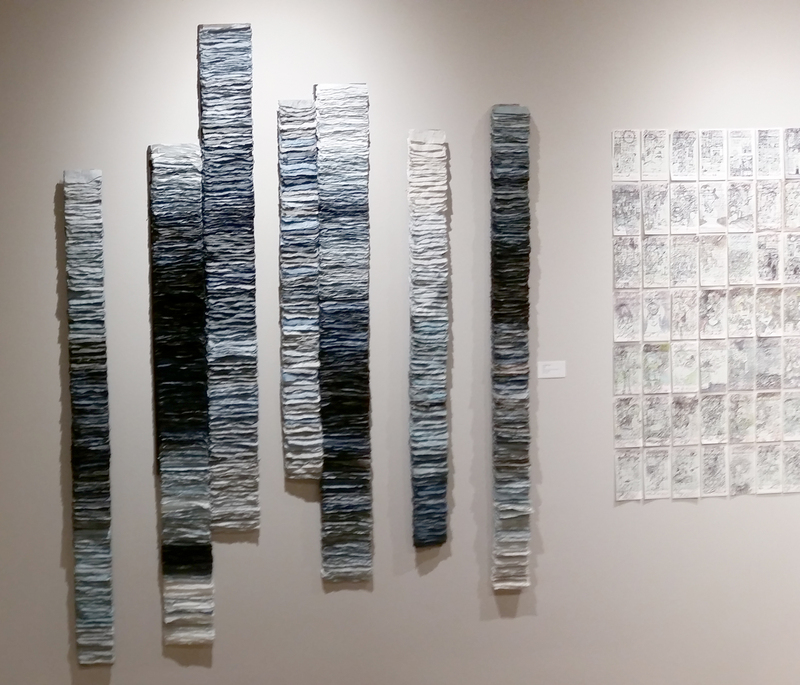 “Paper Arts” shows through May 5 at the Bridgeport Art Center, 1200 West 35th. Next Post Is There a Place for Tromp-l’Oeil in Trump’s Post-Truth Presidency?